Wait, I Thought N.T. Wright Said That First? Nice illustration from Derek Rishmawy about how good modern insights on the text have often already found their way into the life of the Church. Calvin is still insightful, after 500 years. One of my favorite things about reading the Reformers, or the Fathers for that matter, is finding that the best insights I’ve loved in modern scholars aren’t really that new at all. 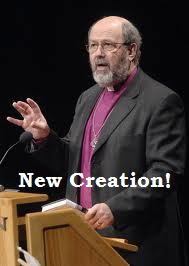 Take the concept of ‘new creation.’ For many of us, N.T. Wright is probably the modern scholar who brought our attention to the theology of new creation. At least for me he did. In his many works on Paul, the Resurrection, and Christian Origins, again and again, he calls us to hear the proclamation that in Christ’s life, death, and resurrection all things, the cosmos as a whole, have been renewed. God wasn’t simply concerned with saving souls off to an ethereal heaven, but rather faithfully rescuing the world from the decay into which it had fallen. Resurrection isn’t just for people, but the universe as a whole. This is bracing and beautifully good news. Previous PostSermon on John 19:28-37 “Jesus, A Thirsty Savior for Thirsty Sinners”Next PostHebrew: the EASY language?